I’m no athlete by a long shot, but I’ve spent enough time hiking in the Phoenix Mountains Preserve to develop my own private names for features and markings. I blame my memory. It’s always a surprise how well my own internal compass and topographic memory works, there in the back of my mind, with no effort on my part. And that’s great. It keeps me out of trouble. However it also comes with an irresistible urge to put names on things. With one exception I’ll spare you those private names, because I see other writers on the web have their own private names, their name choices rub me the wrong way, and I wouldn’t want to rub you the wrong way. My own favorite spot is in the central section of the Preserve, the part just north of Piestewa Peak. You come down 40th Street from the north, past those big loosely defined horse properties bordering the desert, park at the trailhead, and you head in about half a mile to the southwest. You see two peaks there, joined together but isolated from everything else, best approached from the north. They’re relatively small but challenging enough for me. They’re officially nameless and known only by their heights: 1955 and 1928. The 1955 has more complicated sharp palisades near the top but I prefer 1928. My private name for the top of 1928 is the Home Theater. Both peaks, situated on the north end of this broad dry bowl, provide almost the same generous sweeping view southward towards Piestewa, the same breeze, and they’re both usually abandoned even on days when a double row of fourteen hundred chatty pilgrims are clumping up and down Piestewa. They’re easy to overlook, maybe because they usually read as a visual backdrop. They’re easy to take for granted. 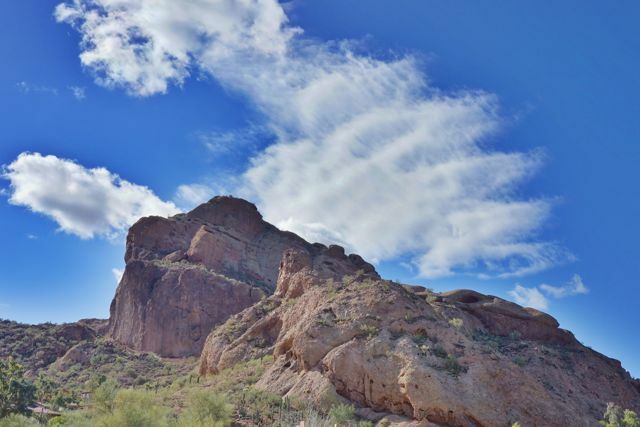 Easy to forget, from Lookout Mountain to Papago Park to South Mountain to the newer stretches of the Sonoran Preserve up north, how extensive it is. South Mountain by itself is the largest urban park in the U.S. at 16,000 acres. And a close runner-up for that title, the McDowell Sonoran Preserve in Scottsdale, holds another 11,000 acres waiting for exploration. If you hike you don’t have to go far in to make the city disappear around you, to find lonely places and beautiful moments, like getting buzzed by those skylarks at the top of Camelback playing in the updrafts. They stand blessedly dark and silent and primal at night, jet-black pools from an airplane window. And that color they turn, that fleeting Cambodian jade green, after two days of rain. Even if you’ve never hiked any section of the Preserve, it still improves your quality of life. Scott Jarson has said, “I have always felt that basically, a home on the preserve is akin to an ocean front view lot in California.” That’s exactly right — a view to an inland sea in reverse. Not comparable to anything else in the whole country, as a set of civic assets they’re fully equivalent to what Central Park does for Manhattan. Obviously the Preserves aren’t what you’d call greenspace, but they’re the center of the city, they’re a commons open to all, and they’re a way to connect to an uncivilized landscape that remains just dangerous enough to hold your attention: rocky heights, jumping cholla, the occasional rattler, dehydration. It’s almost impossible to imagine the valley without them. The visual pleasure of the desert has everything to do with distance and scale, a larger scale than other landscapes. The Preserves function as an important place for the mind to wander and the eye to escape to. And I’d argue that experiencing that contrast is an essential an architectural experience about living in the valley. There is something about seeing the Phoenician Resort from overhead, for instance, as you do from the eastern approach to Camelback, laid out underneath you like a diagram, that’s hard to put words to but terrifically educational. The Zen freshness and contrast of emerging back into the city from the hot uncivilized wild, being able to look at the city backwards from within its negative space, is part of an architectural education about why we live here and how we get that done. It gives you new eyes to look at the bargain we’ve made with the desert.